Bruegger’s Bagels and Jamba Juice celebrate the opening of a new co-branded location in late March on Grant Street in the historic Omni William Penn Hotel. The new co-branded location will offer several new menu items including handcrafted cream cheese and new dessert options such as New York-style coffeecake, cheesecake brownies and Greek yogurt blueberry muffins. New coffee offerings include premium Rainforest Alliance Certified coffees, seasonal single-origin pour-over coffees, specialty espresso beverages and organic 20-hour cold brew coffee. 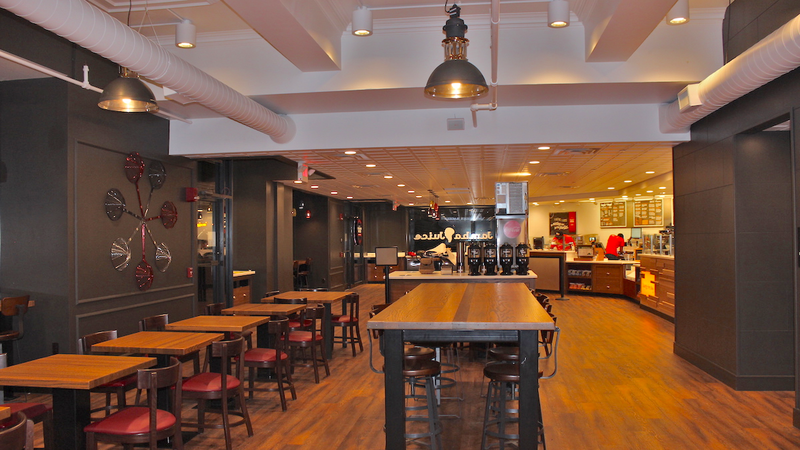 Bruegger’s Bagels/Jamba Juice currently has co-branded locations near the University of Connecticut campus and in Melrose, Massachusetts, in the Boston area. The site selections have put Jamba Juice in mature Bruegger’s Bagels markets to help introduce the brand to new customers. Several other co-branded locations are currently under construction in Massachusetts and Iowa with plans in the works for additional locations in the pipeline. To receive special grand opening offers, guests can sign up for the Bruegger’s Bagels eClub here. Jamba, Inc., owns and franchises Jamba Juice stores through its wholly-owned subsidiary, Jamba Juice Company. Jamba Juice Company is a leading restaurant retailer of better-for-you, specialty beverage and food offerings, which include great tasting, whole fruit smoothies, fresh-squeezed juices and juice blends, hot teas and a variety of food items including, hot oatmeal, breakfast wraps, sandwiches, Artisan Flatbreads, Energy Bowls, baked goods and snacks. As of Sept. 29, 2015, there were 884 store locations globally. There were 94 company-owned and -operated stores and 720 franchise-operated stores in the United States, and 70 franchise-operated international stores. Jamba Juice Company expanded the Jamba brand by direct selling of consumer packaged goods and licensing its trademarks. CPG products for at-home enjoyment are also available online, through select retailers across the nation and in Jamba outlets in the United States.